HairHungary is the pioneering hair clinic in Hungary – one of the first hair restoration clinics introducing FUE system and the more developed FUE2 SafeSystem. They have made their names in Hungary and now they are expanding into European markets to help male and female patients resolve their hair problems. Hungarian hair clinics have a good reputation in Europe for being an affordable option for westerners who are looking for quality hair transplant services but without the hefty price tag available at hair clinics in their home countries. Hair Hungary is a hair clinic built on the principle of quality and affordability, and it promises “exuberant hair at an affordable price.” This hair clinic is located in Budapest and has been endorsed by several famous Hungarian sports personalities like sports TV producers, hockey players and football club managers. Hair Hungary is also the first clinic in Hungary to perform the FUE hair transplant method. 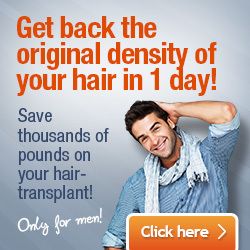 Today, Hair Hungary specialises in the more advanced Safe System-FUE procedure. The clinic has ultra-modern equipment that ensures the success of the procedures. The reception areas, patient examination rooms are wonderfully crafted to make patients feel comfortable throughout their entire visit at the clinic. During the procedure, patient comfort is further ensured by the fact that patients can listen to music, watch movies or browse the internet on their devices. Patients are also encouraged to communicate, ask questions during the procedure and closely follow the work of hair transplant surgeons, count the number of extracted and implanted hair grafts, etc., if this makes them feel more at ease during the surgery. 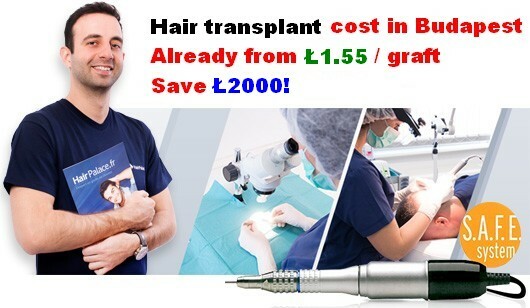 The cost of the Safe System-FUE enhanced procedure is between €0.8 and €1.3/hairbreadth or €1.6 – €2.6/graft. Hair Hungary delivers on its promise of being an affordable option for patients looking to regain their once voluminous hair. For a personalised quote you can make an appointment for a consultation at the clinic or you can opt for a Skype consultation. The clinic has a fairly large team of hair surgeons, hair specialists, and nurses that collaborate together in ensuring best results. The Safe System hair transplant method performed at Hair Hungary is a minimally invasive, painless and non-scarring procedure that ensures higher success rates due to a special liquid that harvested hair follicles are stored in. Hair surgeons at Hair Hungary harvest hair follicles through a special method that reduces damage to the hair follicles both during extraction, storage and implantation, thereby better maintaining the viability of hair follicles. Given that damage to the hair follicles is kept to a minimum and the procedure itself is minimally invasive, healing times are also significantly reduced compared to older procedures, which left patients with scars that sometimes needed prolonged healing times. Hair Hungary is affiliated with several hair clinics from abroad like the HSC Colorado (USA) or PureHair (Germany) that are also collaboration partners in perfecting the FUE SafeSystem procedure and offering patients the best and the latest in hair transplant technologies.